thats an awesome word – tongue. Rosie O’Donnell, you get out of my car RIGHT NOW!! What do you think you’re doing Mr. Bison? Get out of that car. You’re not a human. 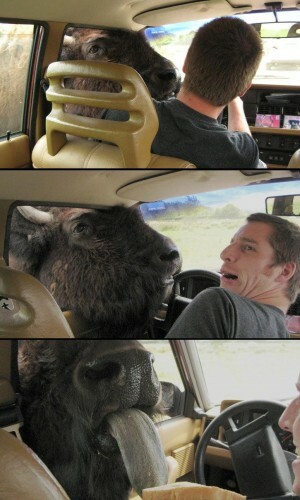 You can’t even drive, you silly Bison. Don’t you stick you’re tongue out at me! The buffalo thinks the seat is his cousin Bob! Bison is not a buffalo! Having a Bison play tonsil hockey with you? I assume this is at Parc Omega, those animals are bold as hell. I went there once as a kid, and a goat climbed into the van. We probably could have stolen it.